If you’re thinking of launching, and your head is swirling with a list of to-do’s, I want you to STOP. 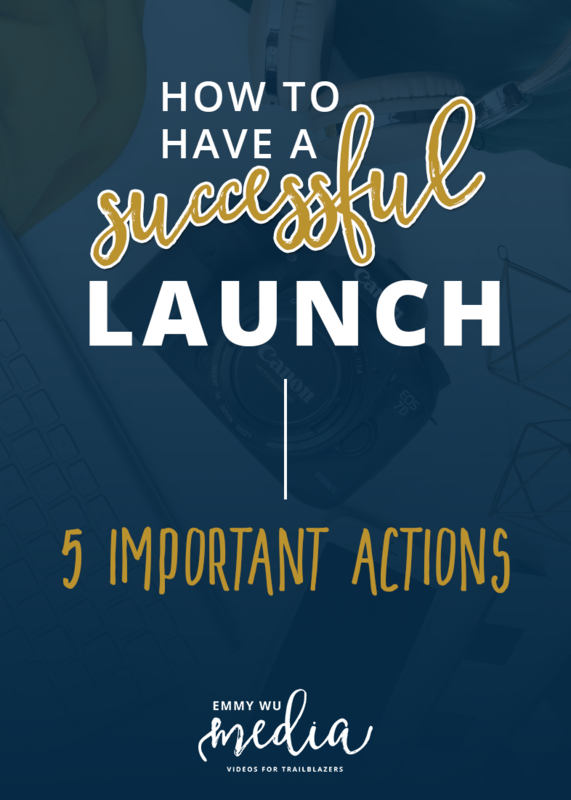 I know there’s a ton of work involved when you’re launching a new product or service, but there are 5 really important things that will help to ensure a much more successful launch, that I bet you’re not thinking of. A really important component of launching is thinking about this whole thing from an outside perspective. Imagine approaching your launch from someone who has never seen your name or brand before. Knowing this, you need to do everything you can to prime them for your launch so they know about you, expect something from you, and see you as a figure of authority so they can trust and buy from you. Give ample time for planning PRE-PRE-launch content at least 2 months before carts open. Yes, this means before you even utter a single word about what you’re launching, you should be using blog posts, or videos, or whatever your preferred social media platform is, to point your audience towards what you’ll be launching. Start mapping out potential blog posts that you can send out in your newsletter that talks about the importance of your once key benefit (which I’ll dive into more later). The worst thing is sharing content that’s totally unrelated to what you’re launching and then wondering why there’s no interest. Well, A: you haven’t primed your audience for your offer, and B: your previous content might be attracting a different audience altogether. Most people miss out on this pre-pre-launch stuff because they think it’s all about the launch. Don’t make this mistake and you’ll begin to grow your relationship with your audience a lot faster, and they’ll be primed and ready for your launch content! Yup, nothing beats good old fashioned interaction. This means answering questions and being of service to others who have questions and showing up and commenting on other people’s blogs that might have complimentary services. For instance, I’m a video editor, so potential complimentary partners could be launch strategists, online course builders or even Facebook Ads strategists. By showing up consistently, you’re showing others what you do and building that trust so when it comes time to join your launch, it’ll be an easy yes for them. Distill your ONE key benefit. This will be CRUCIAL to your launch success. Get super clear on that ONE SPECIFIC problem that you help to solve. You can start by listing out all the benefits of your program, and then narrowing it down to the single most powerful one. Then, just when you think it’s complete, make it even stronger. Your key benefit needs to be really concise and create a visual and emotional impact on your audience. For instance, if you’re a health coach, your key benefit is not to help people eat right and lose weight, its so they can feel free and confident in their bodies. Take some time to really nail your one key benefit and I guarantee that your entire launch will be much more cohesive and effective. It’s a big online world and before you dive headlong into launching your program, basic Google search. Has someone already took the rights for the name you wanted to use? Is that name associated with someone else in a different niche entirely? Or worse yet, the title’s already taken by someone in a similar field. Ouch. These things happen, but it’s important to do your research before hand so you don’t run into any legal issues down the road. It also ensures that how you position yourself in the market, and your approach to the topic you’re launching is actually different and unique, even if it’s in the same field. Start testing your Facebook ads at MINIMUM 3-4 weeks before carts open. A common mistake that I see is people starting to run their Facebook ads just before they start to launch, then two weeks in, as they’re in the middle of rolling out their launch material already, they still have little insight as to which ad sets and demographics their ads are resonating with. You know what that means .. a lot of wasted money and time. And ain’t nobody got time for that! If you’re being smart and creating pre-pre-launch material, think of running ads even to your blog. I’ve seen a lot of success in running traffic ads like this that help to drive traffic to your website, and potentially build your list long before you actually launch. Another really successful tactic is running a short video ad to join your Facebook group where you can funnel people onto your list later. Get really clear on the content that will lead up to your launch then start telling everyone and their uncle about it. This will give you time to read your insights and know exactly who to target and how much you can wisely spend well before you NEED to do it. Great stuff Emmy! Preparing for your marketing/content about your launch is the single biggest thing you can do to draw attention to it from a market that cares, without tossing lots of cash at it. One more thing I’d suggest you add to your FB Ads stuff, make sure your retargeting pixel is installed – up to 6 months in advance. Then all that traffic that comes to read your blog posts and watch your video embeds etc will be an audience you can target your FB ads towards during pre-launch. Awesome watching your biz grow! Thank you for this awesome content.